POLITICAL TIDBITS: Ayala Avenue rally déjà vu for me. No confetti but I’m sure it will come. No definitive solutions yet to plunder of public funds, but great that folks are debating, marching and screaming abolition---and P-Noy resign! Watching Iceland’s handling of “crowd-sourced” constitution and a proposal to set up “Pork Watch Scoreboard” in local entities here at home. Ayala Avenue rally déjà vu for me. No confetti but I’m sure it will come. No definitive solutions yet to plunder of public funds, but great that folks are debating, marching and screaming abolition---and P-Noy resign! Watching Iceland’s handling of “crowd-sourced” constitution and a proposal to set up “Pork Watch Scoreboard” in local entities here at home. Walking to Ayala Avenue last Friday afternoon for the Million March rally where I was to link up with friends at a designated area, I felt a strong sense of déjà vu. I smiled as I passed media vehicles parked along Paseo de Roxas and deep nostalgia swept over me. There I was again where I used to be from 1983 to 1986 as political reporter for the Mr. and Ms. Magazine of Eggie Apostol--- tirelessly marching up and down that historic avenue with the legions led by Cory Aquino vs. Ferdinand Marcos. Later, as the rally afternoon deepened I gazed up the grand canyon of skyscrapers, remembering the flood of confetti in those years, and wishing they’d rain down again. There was hardly any last Friday, but I’m sure the confetti will come later. At Ayala Av the rally was filled with a lot of speeches from a broad spectrum of people, activist songs and gyrations, humor, witticisms, etc. We seniors took turns sitting on portable stools we brought along and munching on kasuy nuts. At some point the crowds spanning several generations raised clenched fists over a modern-day version of Bayan Ko (the exact title escapes me now). Finally came the Hymn itself that many of us vets of Ayala Av ’83-'86 couldn’t bring ourselves to sing in the months of post Edsa 1 without shedding tears. This elderly lady and a few others groped for tissue paper. Nandito pa, buhay pa ang sentimiento para sa bayan, I rejoiced. We must reclaim our country from the rapacious politicos. Just as 73-year old Professor Emeritus Leonor “Liling” Briones was finishing her spiel about those funds in the presidential pork that are “unprogrammed” and “off-budget,” and which the President can spend as though it were his own and for which he does not have to account to anyone, the rains began pouring mercilessly, with some thunderclaps. With a borrowed rain jacket (the skies were so clear that I left my umbrella in the car) I scampered to the safety of the bank row across; but by the time I reached my ride I was drenched to the skin and so were thousands of folks who must have managed to get home only by midnight. The following day I learned from my manicurista how the management of her daughter’s office dismissed its employees early and dispatched them to Ayala Av, complete with Jollibee baon for a night’s stand. The army is indeed growing. In past few weeks since the PDAF scandal broke out it has hogged headlines and endless radio-TV coverage. To those who complain, however, that last Friday’s rally was all noise and chatter but provided no clear solution to the pork corruption, they're missing the point. Scandalized and outraged Filipinos around the country and the world have learned about how the rotten system works---more surprise revelations about secret funds and bribes each day, it seems---and how best to tighten the screws on mindless and conscience-less spending of public funds; how to keep politicians’ dirty hands off the people’s hard-paid taxes. Citizens are talking, talking about the mess everywhere. Now we know all about the PDAFand the "BADAP," the shameless bribery by Malacañang and manipulation by the Drilon-Abad faction during the trial of CJ Renato Corona in the first half of 2012. The question in the minds of political pundits as well as ordinary citizens is: what do we do about it? Where do we go from here? To be sure, except for politicians who have profited from the corrupt system such as the President’s allies (who want to hang on to their pork no matter what), our people are not yet united in their goals in this latter half of 2013. I saw this with my own eyes in Ayala Av when two groups nearly came to blows. One small group carried a “Noynoy resign” banner which angered another group which didn’t want to go that far---and who said the rally wasn’t about getting rid of P-Noy, only of pork. Others want P-Noy impeached for the constitutional violation in the disbursement of the BADAP, especially since it was clearly used to bribe politicians exercising what was supposed to be a grave moral judgment about an impeached official. But these pro-impeachment citizens feel such move in the House won’t prosper, so it's useless. I personally feel, however, that with the help of the independent bloc in the House, they should try it nonetheless. The common thread in protest rallies across the nation and in Pinoy communities abroad is the outrage over the prostitution of the PDAF and the immorality and legal infirmity of the BADAP, both of which flow from the generosity of the “Pork Barrel King.” Then too, many Filipinos are now critical of P-Noy’s ineptness and lack of direction, as markedly manifested in the Zamboanga crisis. But many citizens are still unsure if they're ready for a regime change, perhaps because Vice President Jejomar Binay has his own corruption cases in the past to explain. On the other hand, others talk about the possibility of institutions withdrawing support from P-Noy, such as the Church and Military. Still others now talk openly of his ouster---of P-Noy resign! Two solutions being proposed are worth serious consideration. Star columnist Carmen “Chit” Pedrosa has been advocating a twin solution: the people writing a new constitution---not unlike what common folk in Iceland halfway around the world did---in tandem with a "revolutionary government” composed of men and women of probity and solid moral leadership, that will take over and wield power in a transition period here. In other words, says Chit, NOT JUST REGIME CHANGE BUT SYSTEM CHANGE---a shift to the parliamentary system long advocated by thinking groups who see all the defects of our flawed presidential system with its dynastic hold on power and gripping oligarchic interests over decades. The trouble with the Iceland model, however, as Chit points out, is that while the people there had affirmed by a 2/3 referendum vote their new “crowd-sourced” Constitution drawn up by a 25-member Constitutional Council, it has been hijacked by Iceland’s parliament, the Althing---controlled by politicos in cahoots with foreign interests, who don’t want to let go of power in the wake of that country’s economic debacle a few years ago. The world and we Pinoys are keenly watching developments in Reyjavik. Another solution by someone named Len Dante Clarino in the Internet is to set up a “Pork-Watch Scoreboard” in respective cities and municipalities around the country, which will identify sources of corruption or fund diversion by local officials---from the representatives to the governor, mayors and councilors. Mr. Clarino proposes that these local “Scoreboards” monitor and report cases of abuse of public funds to their “national counterparts,” for possible filing of criminal cases against guilty parties. I assume that Clarino is thinking of harnessing as members of the “Scoreboards” professional people in the localities to serve as volunteers. In this regard perhaps still able-bodied retirees and seniors, especially ex- government officials in the accounting field, church and academic folk---and yes, the students with their boundless energies--- could be drafted. Clarino’s suggestion is excellent, for it’s a fact that the reason politicos have really come to abuse public funds is because there is no FOI Law. P-Noy promised to endorse such a law during his 2010 campaign but he has since abandoned it in deference to his greedy allies. In addition, we citizens have truly allowed our politicos to heftily help themselves to public funds with nary a protest on our part; worse, we kept electing them and their relatives into office. 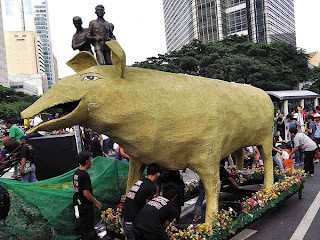 Until the pork scandals involving Napoles broke out and jolted the nation. Tayo din talaga ang may kasalanan---we abdicated our role as watchdogs. Time to be super-kulit on this issue.